Hobbs & Porter supply stainless steel commercial kitchen equipment for the UK catering industry. 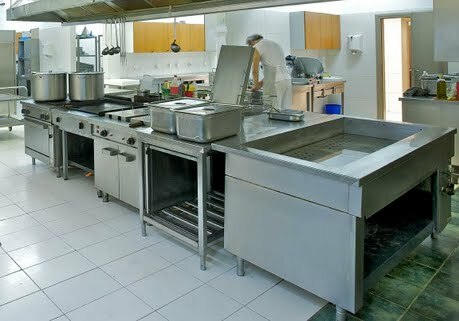 We offer a service of design and manufacture of quality commercial kitchens. Should you prefer, talk to us with your own specifications. We can make stainless steel commercial kitchen base units, commercial kitchen wall units, commercial kitchen doors and drawer fronts. Working restaurant kitchen showing cooker, prep tables and industrial air extraction equipment.